Editing video is hard. With a new program GoPro is looking to make it easy. We previewed the program, called GoPro Studio 2.0, in June, and today the company made it available for free download on its Software+Apps page. Studio 2.0 uses templates and lets you drag and drop raw point-of-view video clips to make quick productions. I tried it with footage from a multisport race in Vail earlier this summer. I strapped a GoPro onto my kayak, bike, and chest during a mud run. See below for my video. Embarrassing to admit, but this is my first-ever video edit. It took a half-hour to produce a 30-second recap video with music, an intro/outro, and transitions. The music that came with the template was a bit dramatic for my footage, but my friends and family enjoyed seeing the adventure on YouTube soon after I got home. A few years ago, a short video like this would have required a professional editing station and hours of work. GoPro realizes that video is still hard to manage, and with Studio 2.0 the brand thinks it’s found a solution. The process is simple: You pick a template and add your clips. You can move your clips around on a timeline and tell the software to highlight a scene. Music syncs automatically to the footage. Tools for image correction and audio overlay were a finishing touch. With a few clicks my mess of footage quickly morphed into a YouTube-style video that was ready to share on social media. Overall, I was stoked with the software and pleased with the quick video I was able to produce. 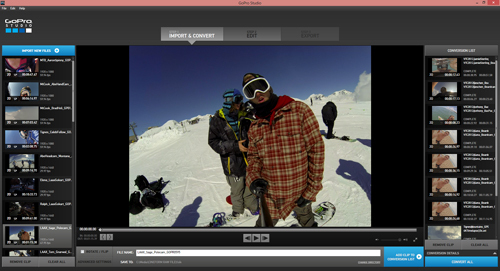 You can try Studio 2.0 for free, downloadable now at GoPro’s Software+Apps page.